Today's prompt: "Ludicrous headline or cure. What’s the most absurd thing you’ve heard about your condition? Whether it’s a cure you’re clearly supposed to try or a headline you’ve come across – the internet is rampant with examples of misinformation and quackery." So I wasn't having a lot of luck finding too many ridiculous headlines. Not for Type 1 Diabetes. Type 2? Well, that's another story. Unfortunately, there is an abundance of false information about Type 2 out there. 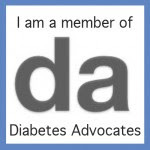 While I myself do not have Type 2, it is a form of diabetes, and I have some wonderful T2 friends in the DOC. This article makes my blood boil on so many levels. It's ridiculous. Headline: "Reversing Diabetes Is Possible." Ok, first level of annoyance. If you read the article, they are clearly talking about T2 exclusively. But do they make that distinction in the headline? No. Way to spread misinformation, CNN. Yes, later in the article they make the distinction between T1 and T2, but we would all be better served if this was clear in the headline. And there's no mention of LADA either. Sigh. The bigger issue for me here is how the headline makes it sound so easy. I didn't really know much about T2 before I discovered the DOC. But I have learned so much from my T2 friends, and am so happy to know them. This headline makes me angry on their behalf. No diabetes, T1 or T2, ever goes away! It is possible to improve your insulin resistance through diet, exercise, and medication, but my T2 friends are in this for the long haul too. This headline is so ridiculous it's insulting. So thank you, Bob, Mike, Rachel, and all other T2s out there. I'm sorry that you are the ones who have to deal with the more ridiculous headlines. It's crap. It should NOT be that way. T1, T2, or LADA, it's all diabetes. We're all in this together. Gina's right.... we can dress up for the Gala. It will be loads of glittery fun! You're very welcome. "Reverse" and "cure" are like four-letter words to me. Even if reverse doesn't have four. i thought cinnamon and celery were the new cure? wait, maybe it was chia seeds and accupuncture. cant remember. lol. annoying the misinformation and ignorance that spreads it. Awesome post and thanks for the recommend! There are all sorts of diets, waters, lotions and potions out there. . for just about everything. And ALL of them are these big secrets. . what "they" don't want you to know. . . Thanks for your attention to these yahoos and email campaign. You're a true advocate! Sometimes, I just get burnt out from all of this. It seems like it's never-ending, and no matter how much we write or share stories, it'll keep happening. Makes you just phase out emotions when seeing headlines like this, and go with the feelings of "Here's another one" and "What difference does it make?" But then, you can and get the ear of a particular receptive reporter or editor who actually does something... and there's hope. Hope that we CAN change perceptions. One media outlet at a time. So, thank you for being a part of the advocacy on this. Against CNN. Against Reader's Digest. And so many others. You rock, Jess.